There was a pall of gloom in Gwalior, birthplace of the former Prime Minister Atal Behari Vajpayee, ever since news of his demise spread in the city. Vajpayee was born at Kamal Singh ka Bagh area in Gwalior. His primary education and some part of college education was completed in the Gorkhi School and Maharani Laxmi Bai College situated here. People from across the Gwalior region as well as the state are coming to visit his ancestral home, where his niece Kanti Mishra lives, to pay tribute to their leader. Vajpayee’s father was a teacher in Gwalior and came from Bateshwar (UP) via Morena. Madhya Pradesh Chamber of Commerce and Industry, Gwalior, appealed to traders and shopkeepers to shut down their businesses as a mark of respect to Vajpayee. Most markets of the city were closed on Friday. 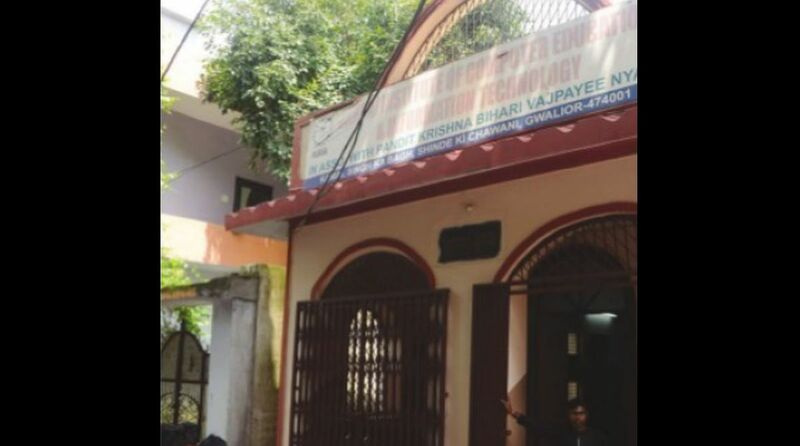 Crowds gathered at Vajpayee’s parental house (in photo) where a computer education centre runs and his niece, Kanti, 72, lives. “The last pillar of the family also fallen down,” said Kanti Mishra when she heard of Vajpayee’s demise and started weeping. “Atal ji was the childhood friend of my late husband and he was fond of visiting the ‘Gwalior Mela’ ( a historical trade fare of Gwalior, started by Gwalior’s erstwhile Scindia’s dynasty) so he used to come here and he used to take my husband and other neighbours with him by Tanga every year,” said Kamla Mishra, a neighbour of Vajpayee in Kamal Singh Ka Bag. Vajpayee had three brothers and three sisters. The families of two brothers and a sister stay in Gwalior. Member of Parliament from Morena constituency and former MP minister, Anup Mishra, is Vajpayee’s nephew and lives in Gwalior. Most of the family members have gone to Delhi to attend his cremation ceremony. Most leaders of BJP and Congress including Chief Minister Shivraj Singh Chouhan, Union Minister, Narendra Singh Tomar, MP minister Jaibhan Singh Pawaiya, Congress leaders Digvijay Singh and Jyotiraditya Scindia have cancelled all their programmes to rush to Delhi. Several state ministers, MPs and MLAs from across Madhya Pradesh, specially from Gwalior, have also gone to Delhi to attend Vajpayee’s funeral. The former Prime Minister used to come to Gwalior frequently to attend family functions and festivals till he suffered a stroke in 2009. The people of Gwalior are paying tribute to Vajpayee by holding different events at various places. Vajpayee had celebrated his 71st birthday on 25 December 2004 in Gwalior with his family members and the people of the city. His family said Vajpayee was very fond of sweets and savouries made in Gwalior. Family members in Gwalior used to send him ‘Bahadura Ke Laddu’, ‘Doulatganj Ke Magode’ and ‘Phalka Bazar ke Namkeen’ regularly.